At Carolina Coatings & Tile, Inc, we specialize in custom tile for all types of projects, including flooring, bathroom sinks and bathtubs, kitchen backsplashes, surroundings, niches, picture frames, and fireplaces. We’ve served customers throughout North Carolina, South Carolina & Virginia, and have provided consultation, custom design and exquisite installation to each home. Whether you want a small mosaic backsplash or a master bathroom stone renovation, no project is too small or large for our team! Owner Raoul Tonini was born in Italy where ceramic and marble were a part of everyday life. He started working with tile at a young age and since has acquired thorough experience in unique ceramic, marble, stone and mosaic tile designs and installation procedures. 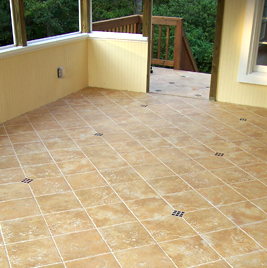 Tile is a great way to make a lasting impression that is always unique and eye-catching. To learn more, please contact Carolina Coatings & Tile today at 919-795-3597, or submit an online request form located on this page.